I'm experiencing an issue with Flashgot + Youtube, in that I no longer seem to be able to get a 1080p MP4 file listed on relevant videos, only the WEBM format or 720p MP4's. This was occurring with Flashgot 1.5.5.5, so I updated to 1.5.5.92 and the same issue is present - at a guess, Youtube might have changed how the 1080p mp4 is presented to the browser? (Firefox 22 here) I'm not sure if this is something that can be easily fixed or not but I thought I would make a post here to highlight the problem. Sorry, forgot to include in original post: I also tried the latest development build and 1080p MP4 is also not available there. Hello again! I've been fiddling around with the second example, the one with the 4K viewing options, and found the source now seems to have two separate areas of <script> where the formats and defined and the URL's provided. 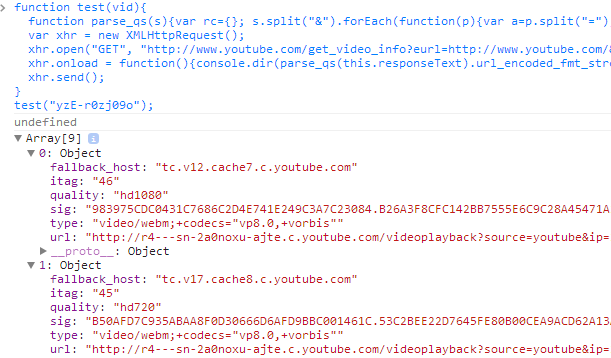 It seems to start from the "<script>var ytplayer = ytplayer " part of the source, and the first chunk does indeed only seem to contain up to 1080p WEBM formats. edit - oops! I didn't get audio with the files. I will see if I can figure out why that is missing and update this post ..
Greatscott wrote: at a guess, Youtube might have changed how the 1080p mp4 is presented to the browser? Either that, or a temporary YouTube hiccup (because it works for me now), or you've got a userscript that modifies ytplayer's properties (in which case you probably want to find and kill talk to its author), or you're opening the Available formats submenu too soon - before the response to the 1080p mp4 HEAD request arrives. 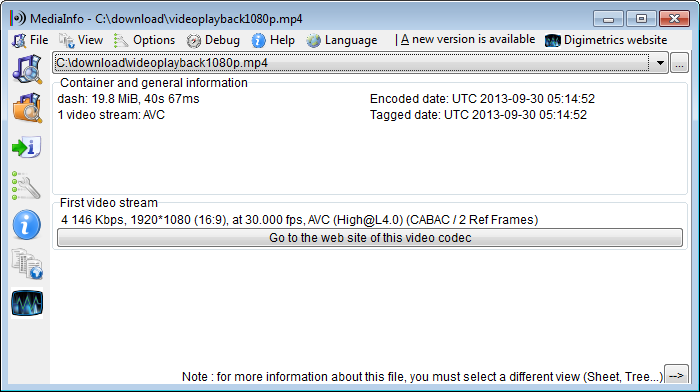 With this script, you can test if you're getting the 1080p mp4 stream at all. The output should looks something like this. 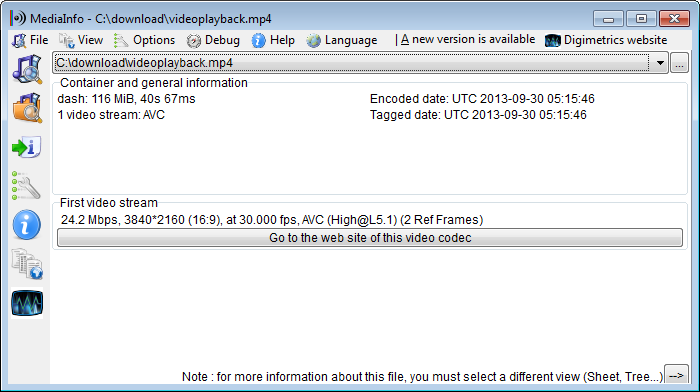 user wrote: With this script, you can test if you're getting the 1080p mp4 stream at all. The output should looks something like this. But then, I tested on another machine .. and it's similar to yours - the second result is 1080p mp4. Even after deleting cookies and restarting Firefox with addons disabled, it still only gives the WebM options. Very strange. I suppose this is really a problem with my config now! Will have to try and figure out what's going on. Thanks for your help! This also can be fixed by deleting the VISITOR_INFO1_LIVE cookie: Tools -> Page Info -> Security -> View Cookies. I am not still getting anything higher than hd720 mp4 choice for this video http://www.youtube.com/watch?v=kgddJPi7NIY As some have pointed out that hd 1080 also exists and this is visible in the VDH(competitor) menu . Dreams are REAL possibilities. Pursue them with zest and you can make them HAPPEN! user wrote: This also can be fixed by deleting the VISITOR_INFO1_LIVE cookie: Tools -> Page Info -> Security -> View Cookies. I've been using this trick for the past week or so, but now I can't keep the cookie away. It re-creates itself every time I refresh the YouTube video to try and get the 1080 streams to show up. Also, I tried deleting and blocking all *youtube.com cookies from being created in the first place, and it still isn't working. Confirming similar results to yourself Joker, I can't trigger anything other than 720p options despite trying different (clean) profiles, flushed cache + cookies, and even attempting downloading with a chrome plugin, all seems to be forcing the restricted downloadable options. Last edited by Thrawn on Tue Oct 22, 2013 4:20 am, edited 1 time in total.